Jay Cutler proved he is the ULTIMATE BEEF making it 3 victories in a month as he took out the 2003 San Francisco Pro Grand Prix. Chris Cormier again had to settle for 2nd place with Dexter Jackson 3rd. Held in the Zellerbach Hall on the UC Berkeley Campus, the event was packed to the rafters with cheering fans. Plus!! Special guest appearances by RONNIE COLEMAN and GÜNTER SCHLIERKAMP as they faced off and hit poses in this build up to the Mr. Olympia. 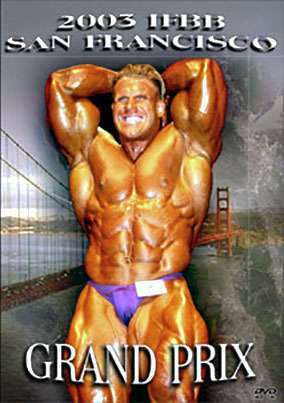 Jay Cutler proved he is the ULTIMATE BEEF making it 3 victories in a month as he took out the 2003 San Francisco Pro Grand Prix. Chris Cormier again had to settle for 2nd place with Dexter Jackson 3rd. Held in the Zellerbach Hall on the UC Berkeley Campus, the event was packed to the rafters with cheering fans. Plus!! Special guest appearances by RONNIE COLEMAN and GÜNTER SCHLIERKAMP as they faced off and hit poses in this build up to the Mr. Olympia. Matt Canning review on this DVD.